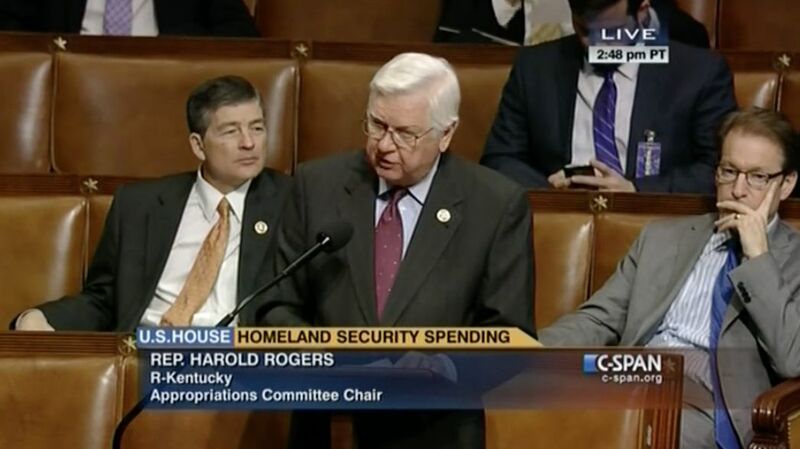 WASHINGTON, D.C. - U.S. Rep. Harold "Hal" Rogers (KY-05) applauded passage of the 2015 federal funding bill in the U.S. House of Representatives for the U.S. Department of Homeland Security (H.R. 240), along with five immigration-related amendments to bring President Obama's executive amnesty order to a halt. As Chairman of the U.S. House Appropriations Committee, Rogers spoke on the floor of the House about the importance of this legislation to national security. "The security of our homeland is one of our highest priorities. This bill provides $39.7 billion for that purpose – to protect our borders, defend against the threats of terrorism, and enforce our nation’s laws," said Rogers. "Today, we will also consider amendments to the bill that will address the President’s recent executive action on immigration. One of these amendments would prohibit any funding, including that collected by fees, from being used to implement the order. The American people have spoken loud and clear – they want our immigration laws enforced, rather than unilaterally changed in a way that undermines the spirit of our constitution and the integrity of our laws." Expresses the sense of the Congress that U.S. workers should not be harmed by the President's illegal actions, a reference to the perverse $3,000 incentive created by the President's order to hire illegal immigrants. The legislation passed the House on Wednesday, January 14 with a vote of 236 to 191 and now heads to the Senate for consideration. Click here for more information about H.R. 240.